A framework to define classes of owners of sensitive primitives. The owner is the link between application and selection data structures. For the application to make its own objects selectable, it must define owner classes inheriting this framework. Initializes the selection priority aPriority. Constructs a framework with the selectable object anSO being attributed the selection priority aPriority. Constructs a framework from existing one anSO being attributed the selection priority aPriority. Clears the owners matching the value of the selection mode aMode from the presentation manager object aPM. Reimplemented in AIS_PointCloudOwner, StdSelect_BRepOwner, and MeshVS_MeshEntityOwner. Returns TRUE if this owner points to a part of object and FALSE for entire object. Returns true if there is a selectable object to serve as an owner. Reimplemented in AIS_PointCloudOwner, StdSelect_BRepOwner, MeshVS_MeshOwner, MeshVS_MeshEntityOwner, AIS_DimensionOwner, AIS_ManipulatorOwner, and AIS_TrihedronOwner. if this method returns TRUE the owner will allways call method Hilight for SelectableObject when the owner is detected. By default it always return FALSE. 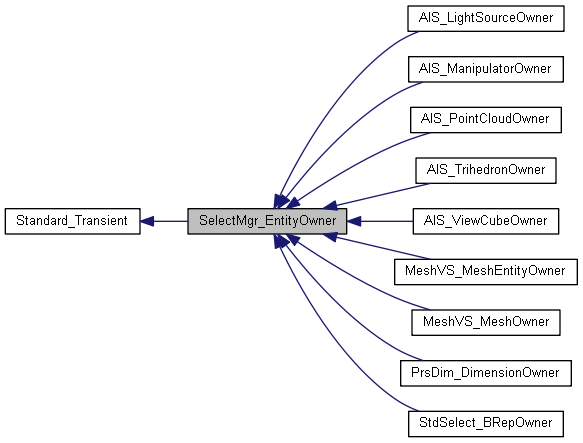 Reimplemented in AIS_PointCloudOwner, and MeshVS_MeshOwner. Returns true if the presentation manager aPM highlights selections corresponding to the selection mode aMode. Reimplemented in StdSelect_BRepOwner, AIS_DimensionOwner, MeshVS_MeshEntityOwner, AIS_TrihedronOwner, and AIS_ManipulatorOwner. Returns true if pointer to selectable object of this owner is equal to the given one. Standard_True if the owner is selected. Returns a selectable object detected in the working context. Sets flag indicating this owner points to a part of object (TRUE) or to entire object (FALSE). Set the state of the owner. theIsSelected [in] shows if owner is selected. Set Z layer ID and update all presentations. Set the state of the owner. The method is deprecated. Use SetSelected() instead. Removes highlighting from the owner of a detected selectable object in the presentation manager. This object could be the owner of a sensitive primitive. Reimplemented in AIS_PointCloudOwner, StdSelect_BRepOwner, MeshVS_MeshOwner, MeshVS_MeshEntityOwner, AIS_DimensionOwner, AIS_TrihedronOwner, and AIS_ManipulatorOwner.